WP10 Series | Japan Aviation Electronics Industry, Ltd. 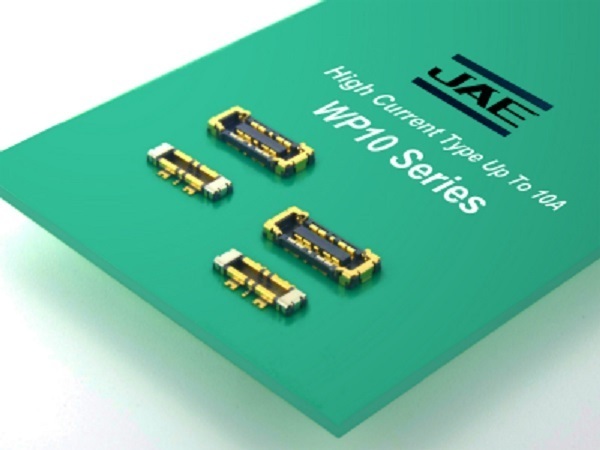 The WP10 Series is a stacking type board-to-board (FPC) connector which is low-profile and saves space. It is ideal for high-current connection areas like battery connections in compact hand-held devices such as smartphones, wearable devices, and tablet PCs. This product features a high-current compatible power terminal and allows for power distribution of 10A. The hold-down structure which has a lock area prevents damage to the connector during mating, improves operability for customers and also has a high extraction force to prevent disengagement of the product. 2 rows, 0.7mm stacking height. Power terminals compatible with 10A power supply (5.0A/ pin x 4pin). 2-point structure design for both power and signal terminals to resist twisting stress. Product with thicker plating is also available. Armored, durable hold-down structure with lock area that enhances retention force and adds protection to the mating surface to prevent damage to the plastic insulator. Improved workability for customers with a clear click feeling during mating. Contact structure ensures high wear-resistance and high conduct reliability.